The tax code has become even more corrupt and complex, with more than 4,600 changes just between 2001 and 2012 according to a withering report from outgoing Senator Tom Coburn of Oklahoma. EU governments are too optimistic about their economic prospects and their ability to control public spending, leading to them continually missing their budget targets, a European Commission paper has argued. …their growth projections are 0.6 percent higher than the final figure, while governments who promise to cut their deficit by 0.2 percent of GDP, typically tend to increase their gap between revenue and spending by the same amount. Needless to say, American politicians do the same thing with their forecasts. If you don’t believe me, just look at the way the books were cooked to help impose Obamacare. But set aside everything I just wrote because now I’m going to tell you that we’re making progress and that it’s actually not that difficult to constructively address America’s fiscal problems. First, let’s look at how we’ve made progress. I just wrote a piece for The Hill. It’s entitled “Republicans are Winning the Fiscal Fight” and it includes lots of data on what’s been happening over the past five years, including the fact that there’s been no growth in the federal budget. You should read the entire thing for full context, but here are a few brief excerpts on why the left can’t be feeling very happy right now. …Democrats presumably can’t be happy that the lion’s share of the Bush tax cuts were made permanent. …revenues are now projected to average only 18 percent of GDP over the next 10 years…a smaller tax burden than we had throughout the Clinton years. And you can’t finance big government in the long run without a lot more revenue. And they definitely can’t be happy that domestic discretionary spending is now below where it was during the Bush years, when measured as a share of GDP. 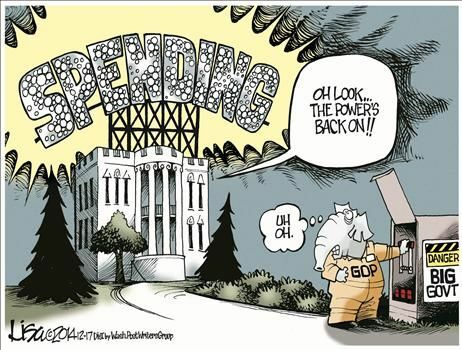 And with sequester-enforced budget caps, it’s quite likely that number will drop even further. …Perhaps even more important, looking forward, is that House Republicans for four consecutive years have approved budget resolutions that assume genuine reform of Medicare and Medicaid. And they’ve won their biggest majority since before World War II, so GOPers can feel reasonably confident that voters (perhaps sobered up by the fiscal disarray in Europe) understand the need to modernize these programs. By the way, the point about keeping taxes under control is critical. Simply stated, it’s virtually impossible for government to get much bigger without a stream of new revenue (or, in the case of a value-added tax, a river of new revenue). Let’s now focus on the second issue, which is how we can maintain this progress. Here’s a chart I put together back in September that showed projected revenue over the next 10 years (blue line). 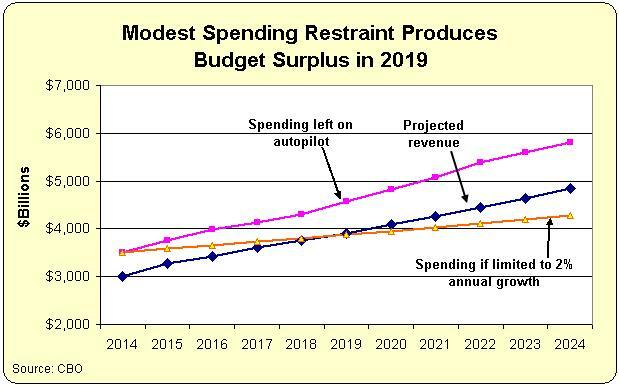 I then showed what happens if spending is left on autopilot and also what happens if policy makers simply restrain spending so that it grows 2 percent annually (gold line), which is actually a bit higher than inflation. As you can see, it’s very simple to achieve a budget surplus. And we don’t even need the same amount of spending restraint that we enjoyed over the past five years! The challenge, of course, is that Obama and many other politicians (including quite a few Republicans) don’t want government on a diet. After all, why let government “only” grow 2 percent each year when you can please the lobbyists, bureaucrats, cronyists, contractors, and other insiders by letting spending increase two or three times faster than inflation? Fiscal probity isn’t easy. Genuine spending restraint not only means saying no to special interests and campaign contributors, it also means picking smart fights. In some cases, Obama and the left may dig in their heels and threaten a partial government shutdown in hopes of getting bigger budgets. Sometimes such fights are unwise, but there’s a very strong case to be made that the GOP ultimately prevailed in the 1995 and 2013 shutdown battles. The bottom line, as illustrated by this amusing A.F. Branco cartoon, is that Republicans shouldn’t automatically act like the French army if there’s a fight over something that really matters – such as a growing burden of government spending. And it also means not falling back into bad habits. 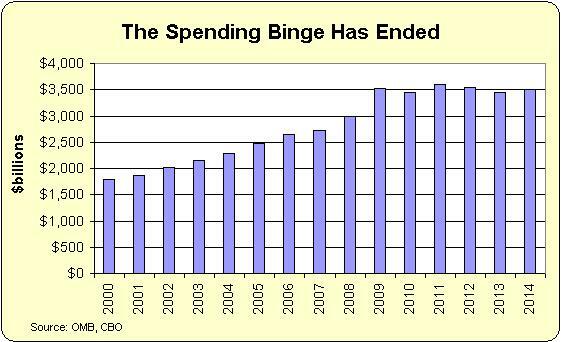 Republicans were profligate big spenders during the Bush years and it’s not easy to stay on the wagon of spending restraint. 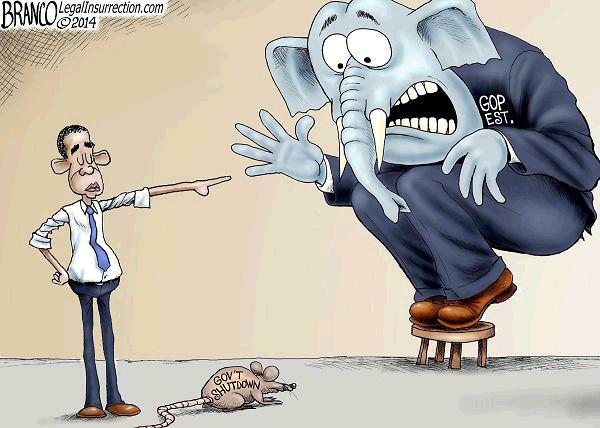 This Lisa Benson cartoon is a good illustration of what will happen if GOPers cater too much to special interests. For more information showing how it is simple to make progress, here’s my video explaining how simple it is to balance the budget with modest spending restraint. It’s several years old, so just keep in mind the chart above as you watch. Though I hasten to add that the real goal isn’t balancing the budget. I’m far more interested in restoring a limited, constitutionally restrained federal government. If we do that, fiscal balance is an easy and obvious consequence. In other words, if you deal with the underlying disease of too much government, you automatically eliminate the symptom of red ink. P.S. 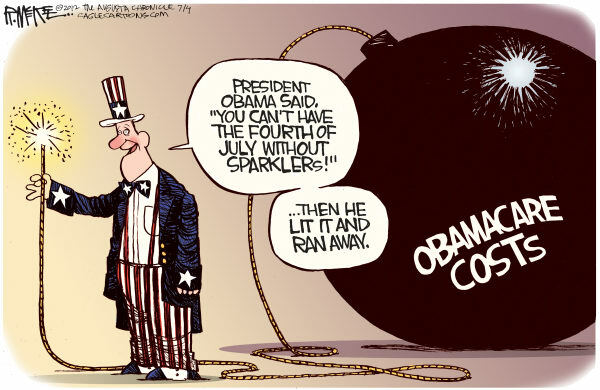 Since I mentioned government shutdowns, I should point out some very good cartoons and jokes on that topic. They can be viewed here, here, here, here, and here. P.P.S. On another topic, I’m disturbed that Sony has cancelled a movie simply because the crazy dictator of North Korea apparently was able to get his henchmen to hack into the studio’s computers. Sure, companies have to focus on the bottom line and make dispassionate decisions, but it’s still troubling. President Obama could earn major praise if he undertook some big public gesture, such as showing The Interview at the White House, perhaps for some of the folks (such as Shin Dong Hyuk) who escaped that brutal regime. In the meantime, here’s a funny, yet also sad, image on what happened. Remember, this isn’t just a dictatorship that has impoverished people with total statism. It is also a regime that starves its people to the point where its army had to lower physical standards because so many young people were stunted by malnutrition. + Encourage all Americans to go see the movie even those who had no inclination to see it. I’m a staunch libertarian, so spending taxpayer dollars goes against my grain, but spending a few dollars in a full-throated defense of our First Amendment rights would absolutely be worth it. 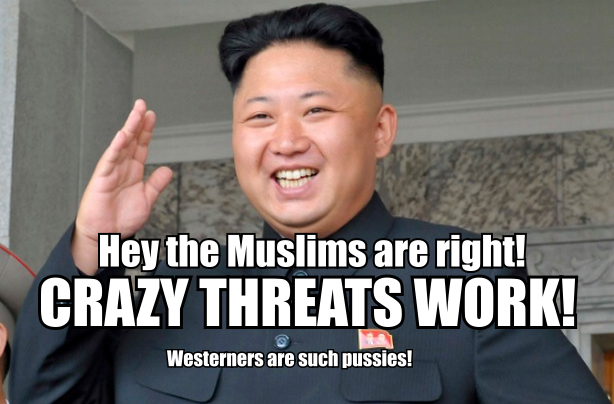 speaking of the Muslims…. you know… it’s just a matter of time until the jihadi crowd infiltrates our boarders… attacks an American school… and beheads infidel children…. all the while the nsa is reading our e-mails… and logging our phone calls… and the smartest man in the room… our Christmas elf… is doing what? playing golf in Hawaii?